Did You Know That Vitamins Do Not Work Without Minerals And 18ml Of Water (also a mineral) Is Excreted From A Chinchilla Daily? Have You Also Wondered Why Your Chinchilla Is Sick Or Not As Vibrant As Usual? 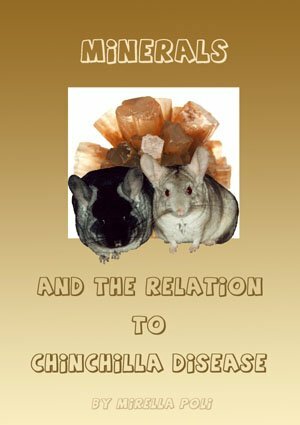 Minerals And The Relation To Chinchilla Disease is an outstanding booklet that has been compiled by published chinchilla author - Mirella Poli. As there is no other booklet currently on the chinchilla market that lists 20 different minerals essential to chinchilla life all in one publication. It has taken all of the author's knowledge via years of experience, cross referencing medical and veterinary manuals, seeking expert advice and obtaining all the latest 'ground-breaking' information on minerals (and in connection to chinchillas) to come up with this unique booklet that is solely dedicated to chinchillas and essential minerals. Other books contain completely separate topics that digress the reader away from their initial interest. Minerals And The Relation To Chinchilla Disease is 'jam-packed' full of information completely focused on minerals with the chinchilla constantly in mind. Uncover the secrets to promoting a long life and potentially eradicating ailments altogether! Minerals And The Relation To Chinchilla Disease comes with peace of mind as it has been written by an experienced published chinchilla author, that has acquired many years of chinchilla knowledge and now wants to share that information with you personally! Minerals And The Relation To Chinchilla Disease has been specifically written in a 'jargon-free' manner and minerals have been listed in alphabetical order for a 'quick-to-find' reference guide. This unique 'chinchilla mineral guide' is a 'must-have' for all chinchilla owners that want to ensure they are receiving the truth about what a chinchilla needs on a daily basis and the sources available that are commonly hard to find. Why Is It So Cheap Considering All The Information It Contains? Minerals And The Relation To Chinchilla Disease is amazingly cheap (£2.75) considering it covers so much information on minerals with the chinchilla constantly kept in mind. This massive saving has been bought to you by self-publishing thus saving literally thousands of £££'s on publisher's printing and storage costs. This booklet should cost you much more but the price has been kept low just for you! Minerals And The Relation To Chinchilla Disease contains all the essential facts you will ever need to know about minerals and their relation to chinchilla life. Do yourself and your chinchilla a major favor today and read Minerals And The Relation To Chinchilla Disease and learn what your chinchilla needs from you on a daily basis. At this present moment you are missing out on vital information that your chinchilla needs you to know about! All that information is contained within Minerals And The Relation To Chinchilla Disease and the sooner you are sat with the pages open, the healthier and safer your chinchilla will be! Remember - There is no other chinchilla book out there that contains the key information on all these minerals without digressing away from the topic! If you wanted to know about minerals and chinchillas then you have definitely come to the right page and if you found this page by accident, then thank goodness!...You have just found one of the most important pages on the internet regarding your chinchilla's life and well-being! Now You Know All This...Dont Let Your Chinchilla Down & Arm Yourself With This Amazing Information Not Available Anywhere Else! than I have found before."